As you step into Babylon Micro-Farms, a startup founded by University of Virginia alumnus Alexander Olesen, the first thing you notice are the sounds. Water gurgles. Fans whir. Motors hum. Next, you notice the space: an industrious, sawdust-swept studio, crowded with equipment, electrical cords and water tables. There is so much to take in you almost miss the trays of leafy plants. Technology juxtaposed with nature might feel incongruous. But for Babylon Micro-Farms, a startup on a mission to help clients grow “fresh sustainable produce at the push of a button,” incongruity is signature to its brand, as well as ingenuity. Hydroponics is an ancient technique used to grow plants in water, rather than soil. But Babylon Micro-Farms, which borrows its name from the Hanging Gardens of Babylon, brings a modern twist. But it’s a leap that this young startup is well on its way to making. Blending an ancient technique with innovative technology, Babylon Micro-Farms develops systems that automate and optimize every stage of plant cultivation. Before the name, equipment and studio off Preston Avenue in downtown Charlottesville, it started with an idea. It was 2015 and then-student Olesen was taking an open-source course with Bevin Etienne of the McIntire School of Commerce and the Frank Batten School of Leadership and Public Policy. “The challenge was to look for low-cost food systems,” said Olesen, who had long been interested in sustainability. It was in that course that Olesen discovered hydroponics. Teaming up with fellow students Patrick Mahan and Graham Smith, Olesen founded Babylon Micro-Farms. As a fledgling startup, it still had a way to go. 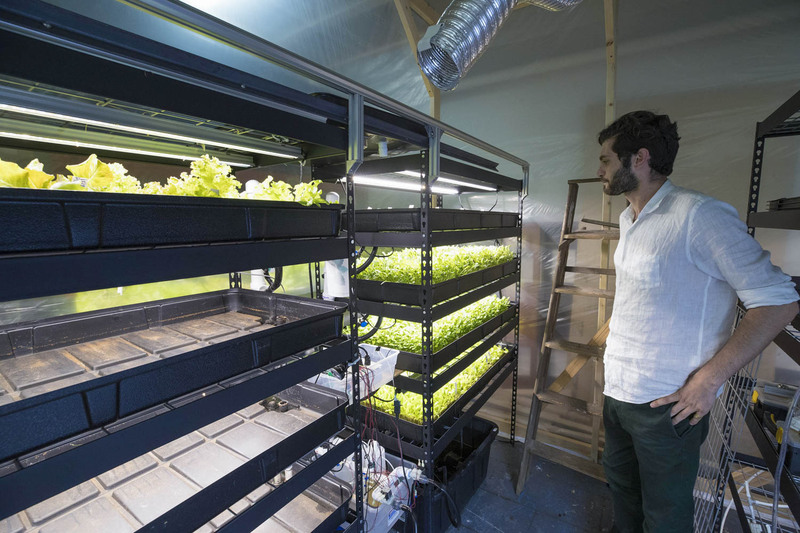 “We built some pretty bulky and unattractive hydroponics systems,” Olesen said. While “a million miles away from a commercial product,” these early iterations serve as benchmarks, illustrating how quickly and successfully Babylon Micro-Farms has evolved in three years. In 2017, Olesen, Mahan and Smith enrolled in the W.L. Lyons Brown III Innovation Laboratory – colloquially known as the “i.Lab,” at UVA. Spearheaded by David Touve, this University-wide initiative fosters and accelerates entrepreneurship within the community, providing programs, work space, mentors and resources. Today, Babylon Micro-Farms offers state-of-the-art systems that control, analyze and optimize plant growth. Tracked from seed to harvest, their produce is organic and pure, free of pesticides, genetically modified organisms, herbicides and chemicals. With systems that grow produce mere steps from the table, the startup eliminates the need for transportation – a process that leaches produce nutrition and quality and guzzles fossil fuel. To date, Babylon Micro-Farms clients include Charlottesville food vendors, as well as the University’s Newcomb Hall and Observatory Hill dining halls. Three years after opening its doors, Babylon Micro-Farms continues to receive overwhelmingly positive feedback. Clients laud the hydroponic systems – the modern design, hyper-sustainability and fresh produce. In fact, there’s only one problem. They want more. For a startup looking to grow, increasing demand is not a problem. It’s a good place to start. “We had been thinking about doing something to scale up for a while,” Olesen said. Then Babylon Micro-Farms received a unique proposition: The Boar’s Head Resort, undergoing top-to-bottom renovations, was seeking to install a bespoke, micro-farm that they could use to grow most produce on-site. Although the founders of Babylon Micro-Farms had never attempted to build a hydroponics system on this scale, it seemed like a perfect opportunity to evolve their product. Merging their signature technology with new design, Babylon Micro-Farms developed a micro-farm to spec. “We are taking personalized farming to an extreme,” said Olesen of the project, which will make the resort self-sufficient in a variety of crops. After three years and sweeping success, it is hard to believe that Babylon Micro-Farms started as an open-source student project to help refugees. But it is to these roots Olesen hopes to eventually return. Partnering with the UVA Climate Resilience Lab – a new entity within Social Entrepreneurship @UVA – and Morven Food Lab, Babylon Micro-Farms plans to research high-impact crops. With time, they hope to use this research to adapt their technology, creating affordable and effective systems that can combat food insecurity on a global scale.